As father time ticks on and collagen is slowly depleted from your cells, you may notice loose, crepey skin below the jaw line. One day – seemingly out of nowhere — your reflection reveals a grandmother-esque looking neck that can make you look and feel years older than you really are. In most cases, this common aesthetic concern is actually a preventable one. Women tend to spend inordinate amounts of attention on the delicate skin around their eyes and on the face, but the neck region is all but forgotten, until wrinkles and skin folds begin to appear. Besides age-related collagen loss, neck wrinkles are caused by repetitive gestures – such as head turns and swallowing – as well as long-term sun exposure. Over time, deep lines and folds can develop in both vertical and horizontal patterns, and once they appear, they can be somewhat challenging to treat because of the neck’s constant motion. Fortunately, there are some options for improving the appearance of neck wrinkles – from targeted exercises to advanced serums that boost collagen and moisturize. Remember that prevention is key! When spending time outdoors, always apply an SPF of 20 or higher on the entire neck. Perfecting your posture can have a huge impact on neck wrinkles. This includes time on the computer and even sleeping. Side sleepers tend to have more horizontal neck lines than those who sleep on their back or stomach. If you can, try and slumber with your neck stretched out long, rather than crooked at a sharp angle. When watching TV or working on the laptop, be mindful of keeping your back straight and chin up. Neck skin is particularly thin and has fewer oil glands than the face. This means that it dries out easily and is more susceptible to the effects of sun damage. There are dozens of creams and serums that are designed to rejuvenate the neck with stem cells, retinol, peptides, Vitamin C and collagen boosters. For the best results, use twice daily and massage upward from the collarbone to the chin. There are thousands of devotees who swear by the firming effects of targeted neck exercises and stretches. The results aren’t immediate, but when performed daily over a month, many people see improvements. Start by tilting your head back, placing your fingers at the top of your neck and gently stroking downwards as you hold the stretch for five seconds. The goal is to strengthen neck muscle and tighten sagging skin so that wrinkles aren’t as noticeable. In some people, vertical cords begin to develop as the platysma – the very thin muscle that runs up the neck to the jaw — separates, giving a turkey neck appearance. A series of Botox injections in the platysma can help relax this muscle and diminish the deep vertical lines. 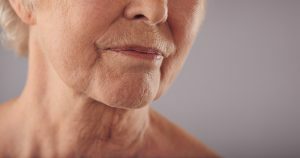 Patients who have deeper, more etched neck wrinkles may benefit from laser resurfacing with Fraxel, which improves skin texture and reduces the appearance of fine lines. Some plastic surgeons may suggest Thermage or Ultherapy to help stimulate collagen production in the neck. However, men and women who are genetically pre-disposed to skin laxity and deep bands around the neck may need a more drastic and permanent fix – a lower rhytidectomy, more commonly known as a neck lift. New York plastic surgeon Dr. Thomas W. Loeb is renowned for his expertise in the field of face and neck rejuvenation. To learn more about cosmetic treatments or neck lift surgery in NYC, we invite you to arrange a one-on-one consultation by calling 212-327-3700.